It’s out, it’s out—it’s finally out! Hello, friends! I hope you are well and enjoying the fall season! I’m so excited to announce that at long last, Book 3 of the Rose Quartz Series is available on Amazon! The sequel to Marry Me Twice and Cassidy’s Daddy, Midnight Dreams wraps up this trilogy set in a tiny, magical town in southwestern New Mexico (but I do have a couple more books in the series in the works—so stay tuned!). Readers love the Rose Quartz series for its multicultural characters, mysterious legend of star-crossed lovers, and touch of magic. 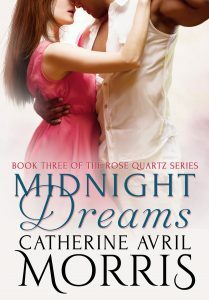 Midnight Dreams is now available for just $3.99 for the ebook or $11.00 for the paperback — get your copy now or read an excerpt!